Late in the afternoon of 6 June 2013 I was standing in the centre of Beny-Sur-Mer Canadian Cemetery. The sun was warm on my face and a cool breeze, which rustled through the leaves of the nearby maple trees, tugged at my hair. Despite the day’s beauty and tranquility, my mind was divided and confused by the emotions I was experiencing. 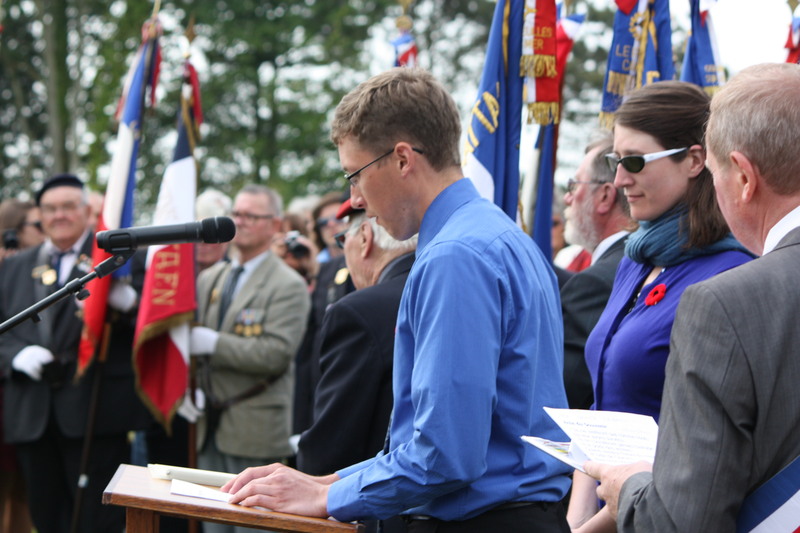 Standing amongst the graves of approximately three thousand Canadians, men who had died during the D-Day bridgehead battles, I felt a profound sense of sorrow. Reading the names on the stones, the ages of those who had died, and the personal epitaphs chosen by family and friends I felt incredibly sad. I realized that too many of those buried had died as young men, barely adults, and that they had lived lives as individual and precious to them as mine is to me. They had loved and had been loved. I wish I could have known each and every one of them, but I can’t. My only consolation is the hope that perhaps they have found some sense of everlasting peace. For me, speaking those words before the living and the dead, meant I had made a binding promise. I committed myself to remember and never forget those who lived, endured, and died while serving under Canada’s name. This duty I have voluntarily undertaken is immense and requires nothing less than devotion. I have become responsible for a memory which, although immaterial and intangible, must be shared so that it might transcend time and place. Where artifacts and relics fade and disintegrate, remembrance could last forever. As I write this blog and think about the Commitment to Remembrance, I can’t help but recall something I was told earlier in the day by a veteran. The moment happened just outside a restaurant in Bayeux, where members of the tour group, including myself, were enjoying our mid-day dinner. We were seated outside enjoying the sunshine and delicious French food. Just a few tables away sat a veteran who, like me, was enjoying a light lunch with his traveling companions. When the veteran had finished his meal and stood up to leave I, not willing to miss the opportunity to thank a Commonwealth veteran of World War II, approached him and, while shaking his hand, I thanked him for his service. The veteran asked in a British accent if we, referring to the people I was seated with, were Canadian. I said yes. He asked if we had been to Beny-Sur-Mer yet. Unsure if he was referring to the town situated on the coast in the Juno Beach sector or the cemetery, I replied that we were going to the cemetery that afternoon. Then the veteran peered into my eyes, his own were blue and red rimmed, and, while grasping my hand, he said: “Be Proud of Them, Be Proud of Them.” After explaining that he was at Juno Beach on the 6 June 1944, the veteran turned and walked away. The veteran’s words can be interpreted in many different ways. Without a doubt I am proud of the military service rendered by Canadian men and women throughout Canada’s history. Yet, I also think that the veteran’s words are intimately tied to remembrance. To be proud of something necessarily demands we remember it. Being proud of something and remembering it acknowledges that that thing holds some form of significance. The sacrifice of Canadians, no matter the conflict, is not insignificant. It deserves to be proudly remembered. Today, I made a commitment to never forget. Will you?